CBS have recently completed a major fertigation skid for the Agri Australis farm in Narranderra between Griffith and Wagga Wagga. 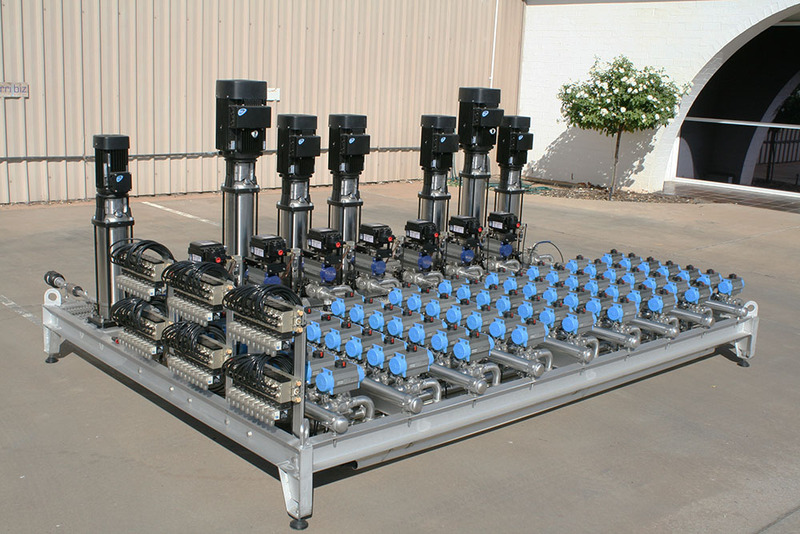 The system was designed in conjunction with Ibis Controls and consists of 9 pumps. These 9 pumps deliver fertilizer taken from any of the 7 fertilizer tanks into the mainlines. The system ensures that the ratio of fertilizer to fresh water is correct using pneumatically controlled multi-position valves. All the pipework is 316 stainless steel and was manufactured, assembled and plumbed in the CBS Griffith workshop before being handed over to Ibis Controls to fit the electrical control system. CBS can custom build Fert systems to suit the requirements of the farmer, from single pump system to multi pump-multi tank combinations.